I know, I just wrote yesterday that I wouldn't be posting much this summer. But this is a perfect excuse for a blog post. At right, another example of the disregard with which visual cultural materials are treated when they're not "Art." The illustration above was reprinted in the New York Times on June 17, 2009. It accompanied an article by Abby Ellin about the use of olfactory stimulation to suppress appetite for weight-loss purposes. The credit line for the illustration was "Advertising Archive," an aggregator of advertisements and periodical illustrations which sells usage rights to material they've scanned and dumped in their database. I don't begrudge the Times or Advertising Archive their business purposes, but where is the credit for this illustrator? I am pretty sure that the piece was produced by Robert O. Reid, a midcentury illustrator who did a lot of work for Collier's. I can't be certain. 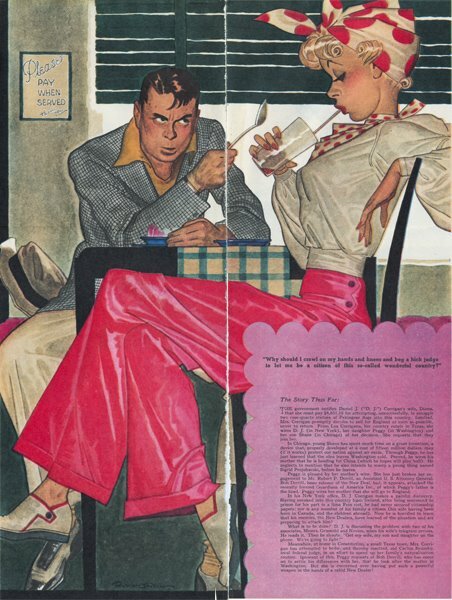 The waitress's impossibly thin waist and the blend of cartooning and volumetric handling are staples of Reid's work, although the brushwork is a little rougher. It's possible that this is an imitator of Reid's style. The conventions of periodical publishing at the time (circa 1940) included clear illustrator credits. They know whose work this is. Why is it acceptable to treat such material as if it had washed up on the beach? Editorial update, Summer 2017: Below, a brief biographical note from 10+ years ago about Reid written by Todd Hignite, once the first curator of the Modern Graphic HIstory, late of Heritage Auctions in Dallas, most currently back in St. Louis with a shingle up at Todd Hignite Comic Art. Back to the Times credit, or lack of same on 06/17/09: This is more evidence of an unacceptable gulf between the standards applied to what is conventionally called "fine art" and other forms of visual material. You could certainly find aggregations of artworks from the 1940s for publishing applications, all of which would require the citation of the artist. Zealously so. Red flag, people! Illustrations, cartoons, and other published images are not now, and have never been, produced by "the culture." They're made by actual people who are active participants in the creation of the things we live among, and by which we are influenced. This should be fixed via correction in the Times. Hat tip to emerging illustrator and former student Rachel Harris, who brought this to my attention. (I take the daily Times, but missed it.) Thanks, Rachel! Robert O. Reid, fiction illustration, unknown issue of Colliers, circa 1940. Robert O. Reid, interior illustration for the August 26, 1939 edition of Collier's.